It's not cheap, but this premium keyboard is packed with features to smooth your creative workflow. 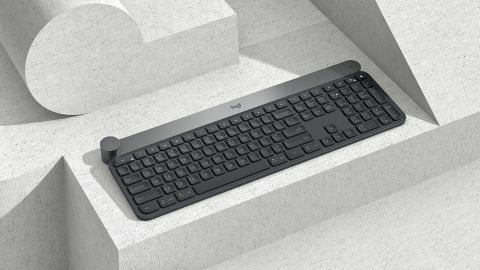 An innovative and well-performing keyboard with features that could make your creative life easier and more efficient. Sometimes an item pops up that you just didn't know you needed, but once it arrives it makes perfect sense. The excellent Logitech Craft wireless keyboard is one such item – which is why it sits in first place in our Best keyboards for creatives buying guide. When unpacked and plugged in (for charging or permanently if preferred) the Craft software is needed. It's a small app that enables you to define certain characteristics and keep the drivers up-to-date. The keyboard itself is a solid-feeling but very low-profile one, with a lightweight keystroke that still has good positive feedback. Another handy feature is the sensors – if you are in a dimly lit area and approach the keyboard, the backlight will turn on. It's a good, clear light but remains subtle enough to not feel intrusive if you are in a colour/light-sensitive environment. So far so good, but what really makes this keyboard special? Apart from its obvious quality, the Logitech Craft has two extra uses that make it a particularly handy input device. First, there is the Creative Input dial. This is the big knob at the top left of the keyboard, which can be assigned all manner of tasks, from simple scrolling and zooming to switching tabs in a browser, various Photoshop shortcuts and tasks, or viewport manipulation. The Logitech Craft has the ability to switch profiles depending on which app you're using. If, like me, you use a keyboard together with a tablet, it makes even more sense, as you can assign the touch ring on your tablet for one task and the Creative Input dial for another, serving to increase efficiency. It also feels good to use and navigation with it is a joy. Next is a feature that won't apply to all, but if it does it's a huge bonus. The keyboard is Mac and PC compatible – but more than that, it can be synced with three machines at once, so with a single button press you can swap between machines you are using. I use it on monitor with both PC and Mac, so this option means I've reduced desk clutter, improved my workflow and increased consistency of 'feel' while working. It may sound like a small thing, but this feature alone makes it worth the cost, and the fact that the keys are marked up for users of different platforms is a useful addition. For artists looking for the ultimate in simplified workflows, quality and ergonomics, this is an excellent option. It isn't cheap, but if the keyboard suits your needs it's well worth the spend. This review was originally published in issue 232 of 3D World.